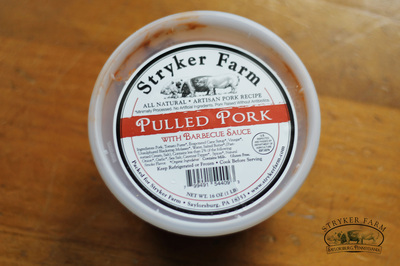 If you want a fun appetizer look no further. 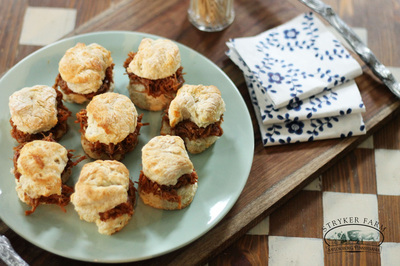 These two bite pulled pork sliders are tasty and easy to assemble. 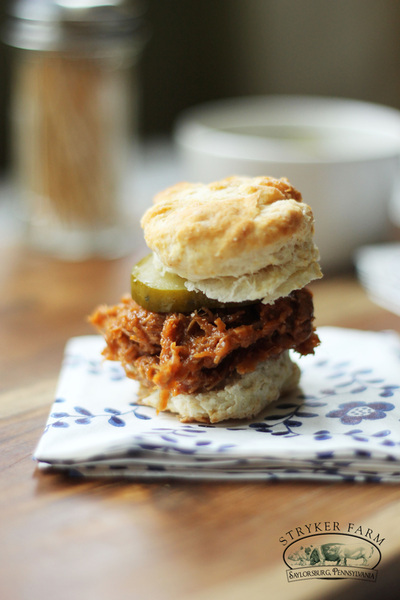 This buttermilk biscuit method taken from Alton Brown, delivers fluffy little vehicles for the prepared Stryker barbecued pork. 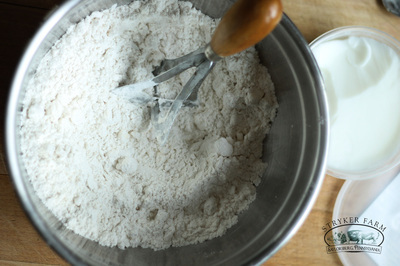 In a large mixing bowl combine the flour, baking soda, baking powder and salt. Give the dry ingredients a stir with a spoon. Next add the fats. It’s important that both the butter and the lard have been chilled. 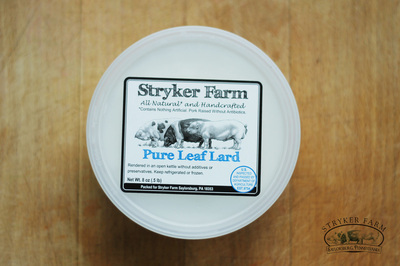 Measure out the butter and lard and add to the bowl. Using your fingertips or a pastry cutter, break up the fats in the dry ingredients until they look like crumbs. Do this quickly! 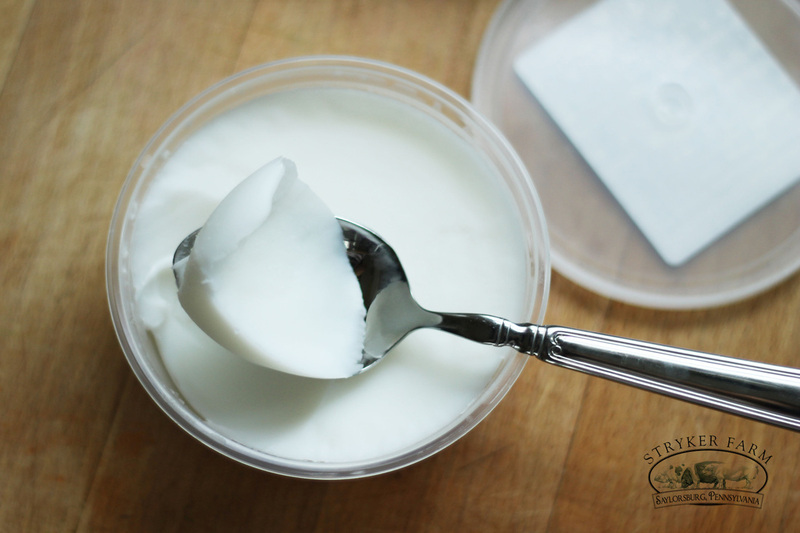 The goal is to break down the fats, but not melt them completely. 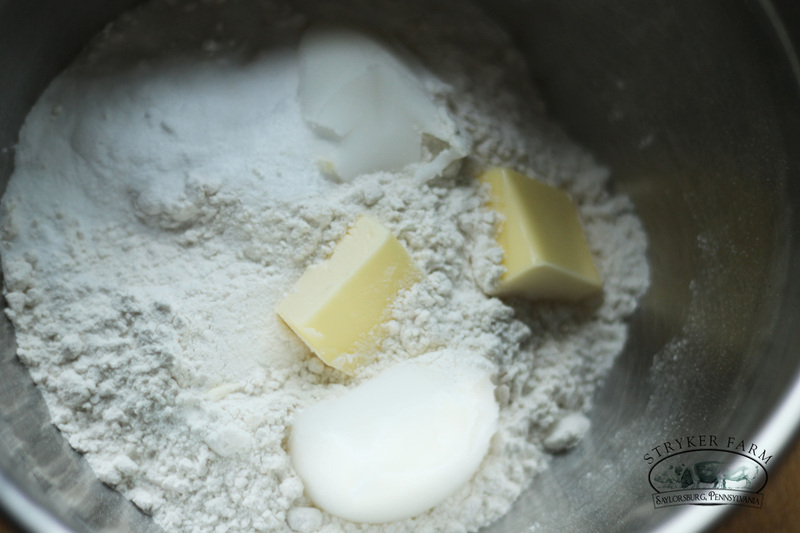 Make a hole in the dough and pour in the chilled buttermilk. Stir quickly and efficiently until just combined. 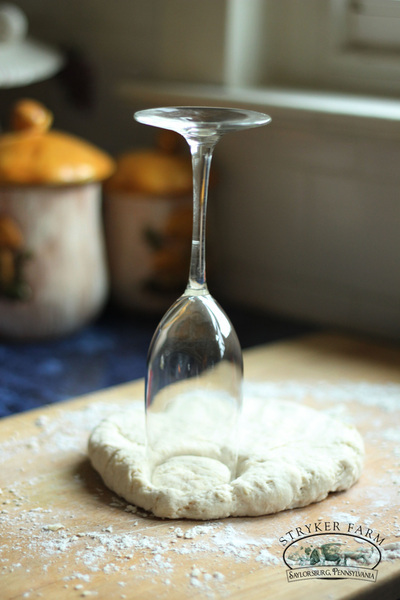 You don’t want to overwork the dough. At this point the dough should be very sticky, that’s good. Transfer the dough to a well floured surface. Give the dough a few turns in the flour, remember don’t overwork the dough. 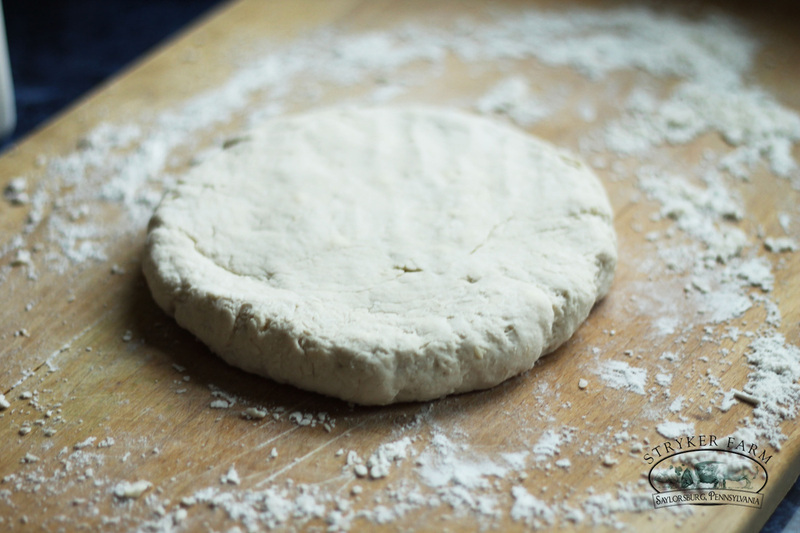 Form the dough into a disc about 1 inch thick. Using a pastry cutter or a glass, shown, cut out the biscuits. For the sliders, I used a champagne flute with a 1 ½ inch diameter. Be economical cutting out the dough getting the cuts as close as possible. 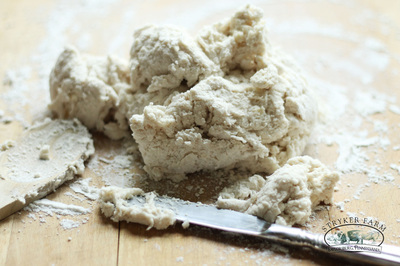 You can reform the scraps of dough to cut out the rest, but those won’t come out quite as fluffy. 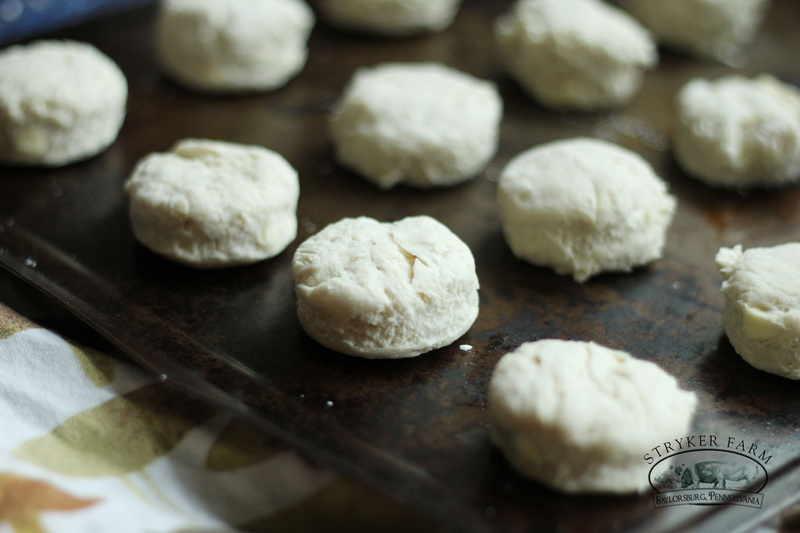 Arrange the sliders on a baking sheet. Bake them at 450° for 15 to 20 minutes until the tops are golden brown and delicious. Let them cool on a rack while you warm up the pulled pork. 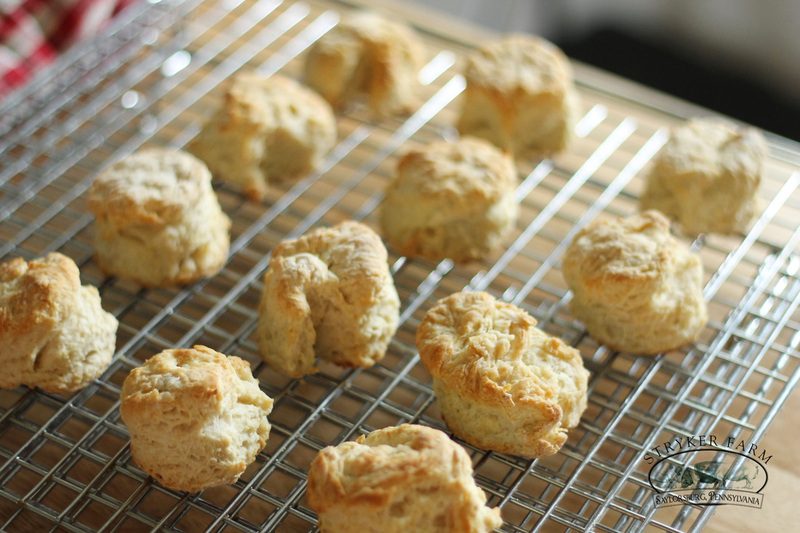 Slice the biscuits in half and add a dollop of pork.